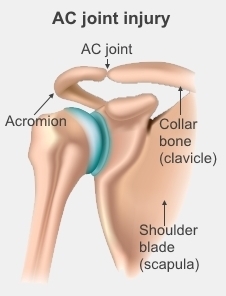 Your AC, or acromioclavicular (ak-ro-me-o-kla-vik-u-lar), joint is the joint at the very top of your shoulder. Usually injuries to this joint happen because you have fallen or rolled on to your shoulder. The way it is treated depends on how bad your injury is. How bad it is depends on how many of the ligaments that join your collarbone (clavicle) and shoulder blade (scapula) are affected. If your injury isn't too bad, you are unlikely to need an operation, but will need to follow a programme of rest and exercise to help your joint heal. If the injury is more severe, you may need an operation to either position the joint so your ligaments can heal, or to repair the torn ligaments. Sometimes doctors suggest you wait and watch to see if your shoulder heals without surgery, but will decide to operate if it doesn't get better. How do I know if my AC joint is dislocated? a hard lump on the top of your shoulder – this shows that your collar bone has moved. This happens in more severe injuries. Your doctor is likely to diagnose a dislocated AC joint by listening to what happened and examining your shoulder. You will also have an X-ray to show just how bad the dislocation is, and may have X-rays of all your shoulder to check for other injuries. If your injury is more complex you may need extra scans. Don't do any heavy lifting, as this will only increase your pain and slow your recovery. You will probably need some time off work to allow your shoulder to recover. Take regular pain relief. The best pain relief is paracetamol (Panadol) or paracetamol and codeine (Panadeine). Take two tablets every four hours, but take no more than eight tablets a day. If you are having difficulty sleeping, try sleeping in a recliner chair or packing pillows around you. Keep your arm in a sling at a right angle – this puts the least stress on the injured part of your shoulder. At first, wear the sling under your clothes, as this will act like a splint for your arm and keep your shoulder still. Don't drive while your arm is in a sling. Hold an ice pack against your shoulder, for 20 minutes at a time, to decrease pain and swelling in the first 24 to 48 hours. You may also find the information about soft tissue injury useful. Keep your hand, wrist, and elbow moving to stop them becoming stiff. As the pain gets better, start doing the shoulder blade squeeze and shoulder shrug exercises. You can also do shoulder adduction and abduction, flexion and extension. If you need surgery your doctor will refer you to an orthopaedic (bone) surgeon. Precisely what operation you have, the risks and benefits, and how long it will take you to get better will depend on the details of your injury. Your surgeon will talk with you about this. Surgery usually involves spending one night in hospital. Afterwards, your arm will be in a sling for six weeks, which means you won't be able to drive for six weeks. You will also have a course of physiotherapy to strengthen your shoulder and get it moving again. You will need to have at least two weeks off work. How much longer you need depends on what your job is, whether the surgery involves the arm you use the most, whether there are light duties you can do that won't harm your shoulder, and whether you can work part-time for a while. If your job involves heavy lifting you may need up to six months off work. While you are recovering, it's best not to lift or carry anything on the injured side. For the six weeks your arm is in a sling you shouldn't lift anything at all – not even a cup of tea or coffee. After that you will gradually be able to increase what you can lift and carry. But you should not lift anything heavy until you have normal movement back in your arm. Your surgeon will let you know when it's safe to start lifting. After your surgery you will have regular follow-up appointments with your surgeon. You will also need some X-rays to make sure the joint stays aligned and is healing well. Written by HealthInfo clinical advisers. Endorsed by Orthopaedic Surgeon, Canterbury DHB. Last reviewed September 2017. Orthopaedic Outpatients Department, Christchurch Hospital. AC joint injuries – patient information. 1 October 2008. Authorised by: clinical director/director of nursing. Ref: 0083.